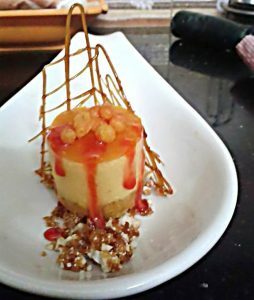 Gajar ka halwa is an all time favorite in my home and so is cheesecake. I had to find a way to combine the two. Here it is a mouth watering sweet treat to beat the summer heat. Enjoy. a. Grate carrot. In a pan mix milk and carrot. Bring the mixture to boil and reduce till thick. Add sugar and cook till done. Add cardamom powder. b. Set in a spring form mold and keep it in freezer for 10 minutes. c. For Garnish, keep aside 1 tablespoon of the carrot halwa to make mini-balls for decoration. a. If using paneer, grate it and keep aside. b. Boil and cook carrot till tender. Cool the mixture, blend and make puree. c. Soak Gelatin in water, double boil and melt. d. Mix grated paneer, condensed milk and sugar in a bowl. Beat them together until smooth. Add carrot puree and gelatin and mix well. e. Remove the carrot base from freezer (step 1) and add the paneer, carrot mixture on top. f. Put the pan back in freezer and leave it to set. g. Test to check if the mixture has set: When touched it should spring back. a. Cook carrot, puree it with sugar. double boil gelatin mixture for 1 minute until clear. 4. Once it is firm remove, from the freezer and place it in the refrigerator. It is ready to be cut into slices and served. Garnish with carrot halwa mini-balls.